Much of the investing world has been hypnotized by the vertigo-inducing roller-coaster ride of crazy cryptocurrencies. But there's another financial revolution taking place all around you. And that is the revolution in exchange-traded funds (ETFs). Since 2000, ETF assets have grown at an average annual rate of 142%. They currently make up 19% of the market. Last year, the "BlackRock ETF Pulse Survey" found that 52% of U.S. investors intended to invest in ETFs. 9 in 10 financial advisors also expect to invest in ETFs for client portfolios. Overall, ETF investors are younger, more engaged and more optimistic about their financial futures than the general investor population. The ETF industry has the mutual fund business on the run. ETFs offer some massive advantages over mutual funds. In fact, I have to scratch my head wondering why anyone would want to invest in a mutual fund ever again. 1. ETFs have no investment minimums, front-end loads or early redemption fees. The front-end loads and early redemption fees that some mutual funds still charge are a retail investor shakedown. Since ETFs trade like stocks, you can buy as few or as many shares as you want. And you can buy and sell ETFs when you want, without penalty. With an ETF, you pay only the cost of the stock commission. Leading brokers like Fidelity and Schwab even offer commission-free ETFs. 2. ETFs offer real-time tracking. Mutual funds price only once each trading day. In contrast, ETFs price all day long, just like stocks. That means ETFs reflect more accurately any sharp moves in the value of an underlying portfolio. 3. ETFs offer real-time trading. Mutual funds are bought and sold only after the market closes. ETFs are bought and sold whenever the markets are open. ETFs are flexible and efficient. Mutual funds are old and stodgy. Mutual funds disclose their holdings once per quarter. Meanwhile, ETFs must report their portfolios on a daily basis. With ETFs, you always know what you're buying. 5. ETFs are tax efficient. Mutual funds generate taxable income as part of the regular process of buying and selling shares. That creates taxable capital gains. In contrast, ETFs exchange underlying securities in kind for ETF shares - a nontaxable event. That means you pay much lower - if any - taxes on ETF gains. 6. ETFs are cheaper than mutual funds. 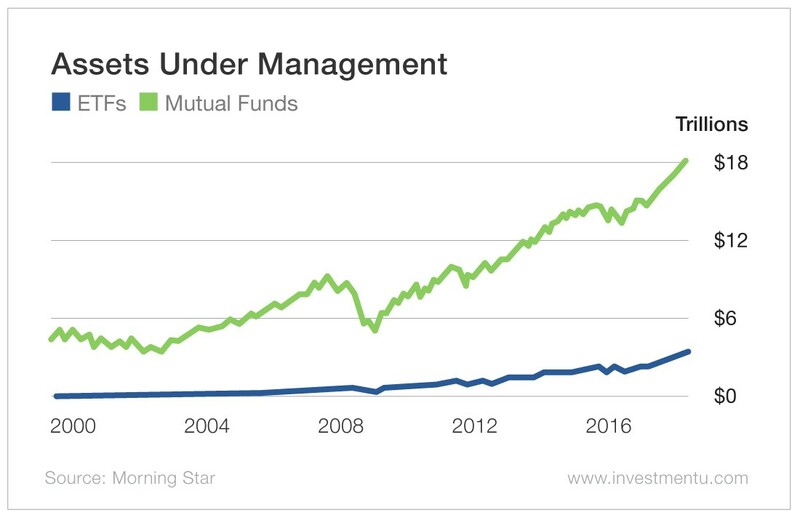 The average mutual fund charges a management fee of 1.13%. In contrast, the average ETF has an expense ratio of 0.44%. Put another way, the average mutual fund is a whopping 157% more expensive than the average ETF. How much impact can high fees have on your returns? The Rydex S&P 500 Fund Class C (Nasdaq: RYSYX) charges 2.31% per year to track the S&P 500 Index. In contrast, the Vanguard S&P 500 ETF (NYSE: VOO) - with an identical strategy - charges only 0.04%. That means the Rydex S&P 500 fund is almost 5,700% more expensive than its Vanguard counterpart. The six aforementioned advantages of ETFs are key to why mutual funds are destined for the dustbin of financial history. Yet I think ETFs offer an even more crucial seventh advantage. And that is the diversity and creativity of ETF providers. I've compared ETFs to Lego building blocks, which allow you to build, brick by brick, a portfolio to fit your specific investment objectives. With ETFs, you can invest in almost any asset class, whether it's stocks, bonds, commodities or currencies. You can invest in dozens of different investment strategies. You can leverage your investments two or even three times. You can even bet against the stock market and make a fortune from a market crash. The ETF space is also remarkably creative. If there is a new asset class, you can be sure that someone is working on a related ETF. Just last week, two blockchain-related ETFs (blockchain is the technology behind cryptocurrencies) were launched. Whatever the asset class, whatever the investment theme, whatever the current direction of the market... there's probably an ETF in which you can invest. The other day, an investor asked me to name my favorite ETF. It's the ETF that makes you money. The wide range of investment opportunities offered by ETFs aligns closely with my personal investment philosophy. I am agnostic as to how - and in which asset class - I make money. Today, it might be an emerging market fund that offers you the best opportunity. Tomorrow, it might be a commodity bet. In two years' time, it might be an inverse ETF that bets against the S&P 500. And to recommend the ETFs I believe will make you the most money, no matter what the market is doing. Join me on this journey in the months and years ahead with my new VIP Trading Service, Oxford Wealth Accelerator.